This is a great seasonal chili recipe that’s quick and easy to make. It’s loaded with gorgeous golden-hued and red vegetables that contain a specturm of carotenoids as well as curcumin-rich turmeric, and the super antimicrobial herb oregano. This meal will fill your bowl with the color of falling leaves and nourish you as only plant strong foods can. While the squash is in the oven, sauté the onions, garlic and bell pepper in a drizzle of olive oil until softened. Add the tomato paste and spices and cook for a couple of minutes. Add in the tomatoes, tomato sauce, beans and tempeh. Mix well. Add in the stock and bring to a low simmer. Cook for 30 minutes to allow the flavors to meld. Gently fold in the roasted squash. Season with salt and pepper. This looks fabulous. It will be the perfect way to use one of our squashes; I love the red and gold colors. Thank you Andrea! It is a great way to integrate seasonal squashes into a meal. 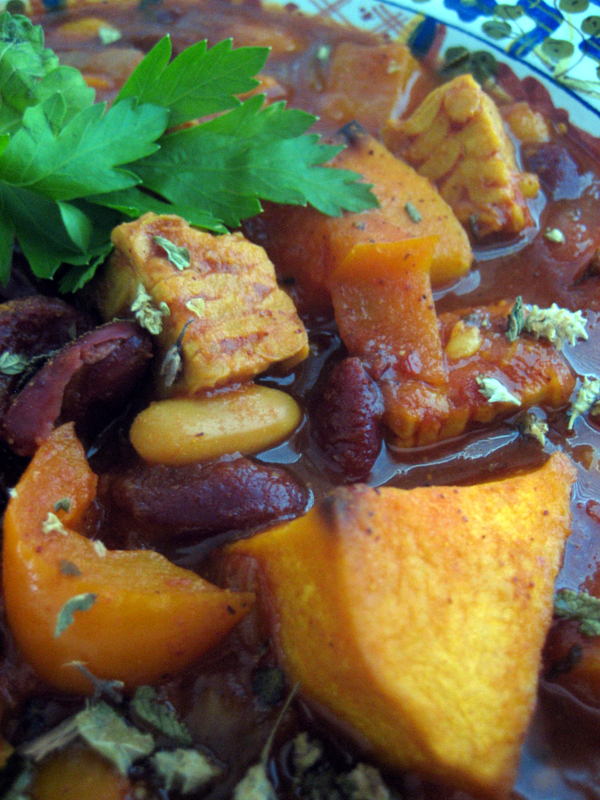 on December 5, 2010 at 6:44 AM | Reply meatless monday recipe: golden chili… | living in a modern world. You just knew I was drowning in squash, didn’t you? This looks delicious! Heh. It’s a great way to tuck some squash into a traditionally squash-less dish!